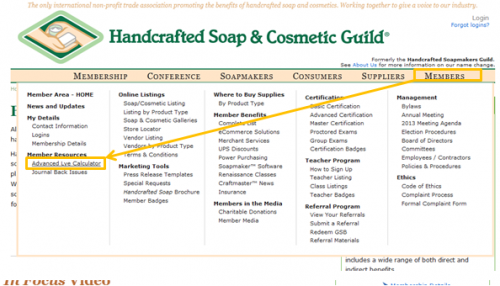 If you’re a new soapmaker, welcome to your new addiction! There are many kinds of soapmaking that don’t involve you needing to handle lye, like rebatching or hand milling a pre-made soap base or the extremely versatile melt and pour style of soapmaking (commonly sold in stores as “glycerin soap”). And that’s where we come into play. The HSCG offers lye calculators for all soapmakers. All soapmakers can access a basic lye calculator through this link. 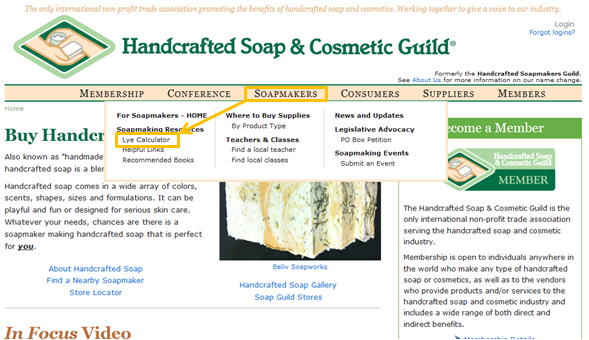 You can also get there by hovering over the Soapmakers heading on the HSCG home page and choosing Lye Calculator under the Soapmaking Resources section. HSCG members have access to an advanced version of this same lye calculator. Get to it from this link or by hovering over the Members heading on the HSCG home page and choosing Advanced Lye Calculator from the dropdown menu underneath the Member Resources section. There’s also a link to it right from the basic lye calculator page. The advanced lye calculator lets you adjust SAP values as well as specify your own saponification values and incorporate oils not already listed in the tool. 2. Choose whether to use grams, ounces, or pounds. 3. Choose whether you want to specify a quantity for each oil OR if you want to specify a total oil quantity and build your recipe by assigning percentages to each oil. 4. Choose whether you are making bar soap (aka using NaOH), liquid soap (aka using KOH), or a cream soap/other hybrid style soap (and you guessed it, you’d be using BOTH NaOH and KOH). When you choose to use both potassium and sodium hydroxide, you get to assign custom percentage to each type of lye (fancy times, indeed). 5. Select your oils and specify how much (or what percentage) of each oil you are using. 6. You can note all the extra herbs, colorants, exfoliants and other non-saponified additives for record-keeping. 7. Customize your display and hit Calculate Now!. You can choose to see a specify water and lye recommendation or you can view a range of suggested values. And you’re done. The results page will display your chosen oils as well as the percentage and quantities used (as well as the SAP value used if you are in the Advanced Lye Calculator). It will also show the recommended lye and water quantities. If you’ve included directions, the results page will include a bit of explanation of the logic. You can easily edit your recipe from the results page, print the results page, or create a brand new recipe. If you’ve used the HSCG Lye Calculators, let us know what you think. What do you wish your lye calculator could do for you?